Partial results coming in from the republic of Tuva and the Magadan, Novosibirsk, Chelyabinsk, Kostroma and Belgorod regions gave the ruling party between 43 and 80 percent of the vote. There were also mayoral elections in Samara, Makhachkala and Pyatigorsk, and city council elections in 14 regional capitals. 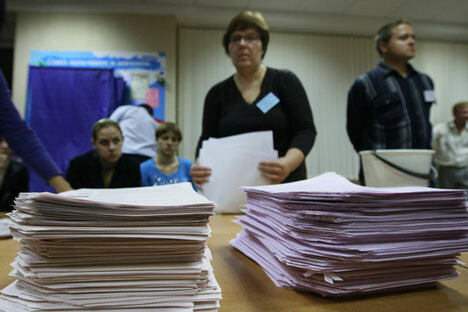 In all, there were elections at various levels of government for a third of Russian voters on Sunday. The count was most advanced in the Far Eastern Magadan Region, where United Russia had what party secretary Vyacheslav Volodin called an "unprecedented" result. With 65 percent of ballots counted, the ruling party had 56 percent of the vote. United Russia Chairman Boris Gryzlov noted that in 2005 the party received just 28.7 percent of the vote in Magadan. He said United Russia had substantially improved its result compared with the previous elections in the six regions, gaining majorities in each of the regional legislatures. The Communist Party's strongest showing on Sunday, according to partial results, came in the Novosibirsk region with 26.61 percent, while the nationalist LDPR won 13.06 percent in Magadan. A Just Russia also performed well in Novosibirsk with 17.09 percent, and was winning 16 percent of votes in Chelyabinsk Region. The liberal opposition parties Yabloko and Right Cause received no more than 2 percent of the vote in any region. United Russia's dominance of regional elections a year ago led three parties in the lower house of parliament - the Communists, LDPR, and A Just Russia - to boycott the State Duma in protest against alleged violations. LDPR leader Vladimir Zhirinovsky said on Sunday he saw no reason to repeat such a protest following this year's voting.